Jaipur: He is an Indophile. The chill of Indian winter less harsh on him rather more welcoming, for his peacock blue silk robe contained more of royalty than an extra layer to triumph over the winter. On the rim , a glittering lining of motif sparkled as he moved, waived his hand, nodded and winked. Hamid Karzai, former President of Afghanistan, returned to India to reengage with his past, from an eternal Bollywood addict came a nuanced “Yeh mulaqat ek bahana hai, pyaar ka silsila purana hai,” greetings. Seeped in a culture where his worldview was formed out of his 6-year stay in Shimla as a student, he hasn’t recovered from the oeuvre of Mirza Ghalib, nor has he parted with his infatuation towards Dilip Kumar, Dev Anand, Lata Mangeshkar. Oddly, he breaks into Hindi for an endearing engagement. Twelve years in office as President, the unmistakable imprint of a head of the State didn’t interfere with his connect with the audience: he represented the agony of a wounded land. A land ravaged by forces from one military to another militancy. Militants and religious fanatics. If Russia was the instigator, Uncle Sham was the perpetrator— and ,in the interim, chipped in the Mujahideen and the Taliban as tormentors and doubled up as executioners. Afghanistan falls in that trap where geo-strategic politics of the sub- continent continues to exploit its physical proximity purely on account of its location: a cheek by jowl existence with Pakistan and China, a gateway to Iran, and its head resting on the foot of Russia. The lure of finding a toehold is always bigger , where the super power indulgence in power play trampling the grounds of Afghanistan. Afghanistan suffers and still continues to suffer. And, somewhere along this axis of alignment, India falls in the inseparable triangle of India- Pakistan- Afghanistan and oscillates between tough decisions and improbable choices. “ I love the people of Pakistan as much as I love the people of India. It is the Pakistan military intelligence establishment that I’ve a complaint against,” Karzai took a more candid route to lay bare his angst at ISI’s patronage of the Taliban, equating it with raising viper at the backyard. He didn’t hold himself either to admit how the monster of Islamic radicalisation was foisted by both Pakistan and America to shoo away the Russian communism that had entrenched deep into the multiethnic Afghan life. 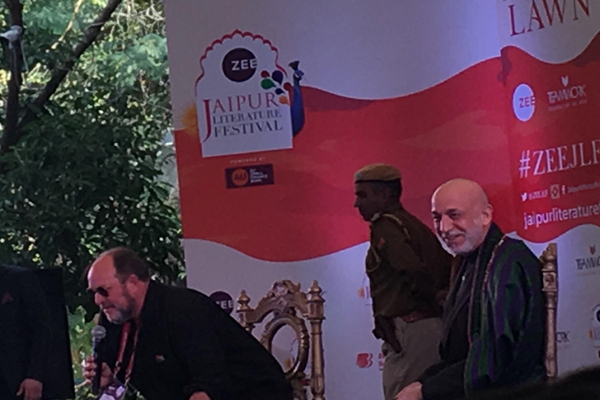 Karzai rues how an all pervasive Sufi culture got lost in the rabid spread of radicalisation perhaps a lesser price the country paid but the biggest price was a utterly chaotic nation that lost its cultural and religion moorings. A self-revulsion returned to him as he admitted, in hindsight, the decision to open the Afghan economy to free market forces was a mistake. With them came plump contracts, all US marked, with them rose corruption and disproportionate asset accumulation in the hands of few. Karzai more generously agree to his own fragility: when he rose to Office he inherited a near poppy less Afghanistan under the Taliban regime but it bloomed under him yet again. “ We produce the best pomegranates, the best almonds and dry fruits, but when people who cultivate them get dispossessed and moved out of Afghanistan as refugees, the irrigation system collapsed, it ,unfortunately, led to poppy growing all over,” he concurred. Sub-continental politics often comes at the cost of life; Karzai smiled through recounting many assassination bid on him. His father wasn’t lucky enough. From personal anguish and loss stems his pain as well for the demolition of the Buddha statue at Bamiyan by the Taliban. While Afghanistan is at work in raising itself from the ruins , the former president dreams of an Afghanistan of educated society that does justice to gender parity, and where arms and poppies get replaced by a cocktail Sufism, its famed dry fruit and the warmth of Afghan’s westerly cultural wind. “You have come from a great civilisation, of thousands of years is age, you have so much to offer to the world. Along with knowledge and technology, you also must offer the depth of your civilisation to the world. You have so much of colour and beauty of your country , present to the world. You are an inherently peace- loving , freedom- loving country — and a tolerant one. You are the melting pot of culture, individuals, and civilisation,” Karzai said addressing the youth of India.